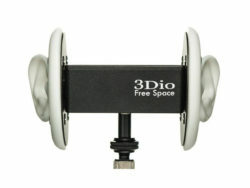 3Dio Free Space Binaural Microphone With Free Ear Muffs! 3DIO Windy Ear Muffs The 3DIO Windy Ear Muffs are the perfect wind guard for the Free Space or Free Space Pro Binaural Microphone. They are a “shower cap” design with a strong elastic opening that you wrap around each ear disc of the Free Space or Free Space Pro.